Welcome to Shader Hub. This site is designed for 3D Artists and GLSL Shader programmers as well as anyone who just wants to play around with computer graphics and WebGL. It is essentially a 3D repository where artists can upload their work and view it in 3D using WebGL. Note that you must have WebGL enabled in your browser to use this site. Below is an overview of the objectives of Shader Hub although currently not all these objectives have been met as it is a work in progress. 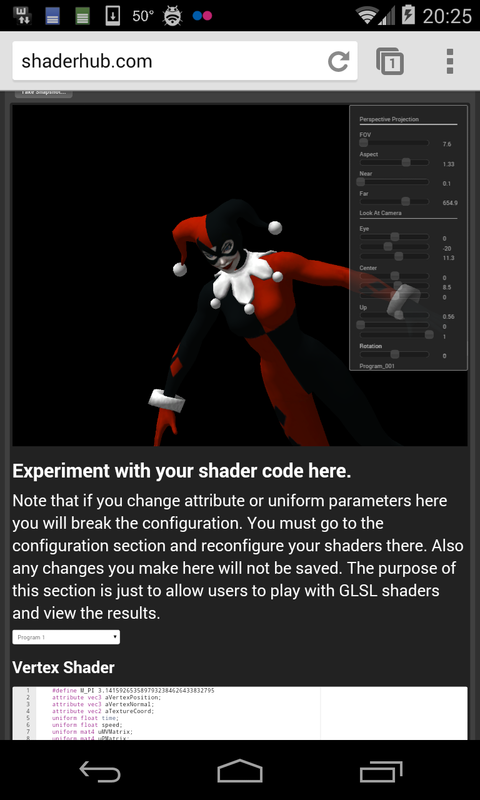 To enable the design of custom shaders supporting GLES 2.0 (suitable for the web and mobile devices). To construct a standard way to share 3D content across multiple platforms including android and iPhone/iPad. To enable direct export from 3D design tools such a Blender/Maya/XSI to a content management system for storing 3D assets. To provide an API for multiple platforms to access 3D content. To provide a scripting engine to interact with the API. To help bring 3D gaming to the net using webGL. I'm the developer of shaderhub.com, so I thought I'd sign up for this forum and thank you for sharing. It is still pretty early in development. It is usable, but I intend to make it better over time.